We are a London and wedding and events florist and we are preparing to stand out from the crowd this year at Earl’s Court National Wedding Show, We intend on creating a beautiful fashionable exhibit unlike anything that has ever been seen before. This year we aspire to be different, we are fortunate enough to have secured a stand right at the front of the show, we would love new brides to come through the doors and instantly see our beautiful floral designs whilst we welcome everyone with our friendly floral team. Our exhibit will surround a tall natural wisteria tree which will be in full blossom during the days of the show. Attracting with scent and visual beauty, the display will be impressive and notable; the exhibit will contain a number of bridal bouquets in a variety of different styles and colours which will then be scattered all around the stand in an assortment of glass vases. From traditional classic white, to modern splashes of colour, the bridal bouquets will be a mix of posy and tear-drop shapes and we will present the bouquets in a way that brides can touch, hold and smell the arrangements during the show. Our florists always create innovative unique floral designs such as hand-made flower hand-bags, stylish floral hair-pieces and natural vintage accessories: the display will also contain the company logo within a framed ivy and rose surround. We will welcome photography and all bridal enquiries and hope that this year will be the best yet. We look forward to seeing you at the show on September 28th, 29th and 30th 2012 at London Earls Court. Most things are personal to each couple, but there are some traditions that everybody sticks to: it starts as soon as you’re engaged; off to the bride’s family home to be blessed by the local priest. With gold rings and arras – which are little gold coins (usually thirteen) that lay with the rings on the pageboy’s cushion to signify abundance – in hand, both sets of parents standing by, and usually whichever grandparents you can rustle up – grandmothers are key here, being the matriarchs of the household. The priest blesses you, your wedding rings, your arras, you future kids, your good fortune in finding each other: everyone and everything. That done, you’re off to start planning your big day! At the bridal shower, the bride’s mother will give her a variety of monogrammed items to take to her new home: towels, pyjamas, bed sheets, and table clothes are an example. Then the night before the wedding, the bride is thrown a serenata by her groom in her family home; family and close friends congregate to drink aguardiente – an anise-flavoured liquor favoured by Colombians – eat mini empanadas , and gift the bride and groom silver goods – plates, platters, and tea sets to name a few – for their new marital home; then the groom supplies the entertainment: typically a mariachi band, who are a group of sombrero-ed Mexicans that sing traditional ranchera love songs, and if the bride’s very lucky: maybe the groom will join in. On the wedding day, the church will be abundantly decorated with flowers – as will the venue for the reception, usually held in country clubs or haciendas – estates. There are no groomsmen or bridesmaids; accompanying the bride will be little flower girls wearing a floral circlet that matches her own and carrying little baskets filled with petals, and a page boy carrying a cushion with the blessed gold rings and arras covered in a piece of lace which will later be turned into the first child’s christening hat. After the bride and groom exchange rings, the groom lights the candle on his left, the bride the one on her right; together they light the central candle, and extinguish their original ones. This is to signify that they have become one body, and then they dance out of the church holding the lit candle. The reception will have lots of floral table designs – which are for the women to take home – alongside being extravagantly decorated throughout, as well as having well-manicured gardens, using garlands and wreaths to bring in more colour. Silver sugar-coated almonds arranged like flowers are scattered across all across the tables, and the wedding cake is always black fruit cake soaked in red wine – the cake plate, knife and slice will be decorated with flowers as well. After the groom throws the garter into the audience, all the men put their shoes under the bride’s dress for her to pick a shoe at random, thereby selecting the next man to be married. There are no speeches – just a lot of champagne – and the main event is dancing; there will be a band playing throughout the evening, playing all the traditional styles of music loved by Colombians across the generations – vallenato, reguetón and merengue being some of the favourites. Before they leave, the couple will be toasted with champagne – their champagne glasses will be monogrammed – and they will drive off into the night to start their married life together; and the guests will party on in their honour. 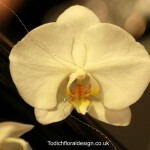 We at Todich Floral Design are always proud when we are asked to provide the flowers for a wedding or event. 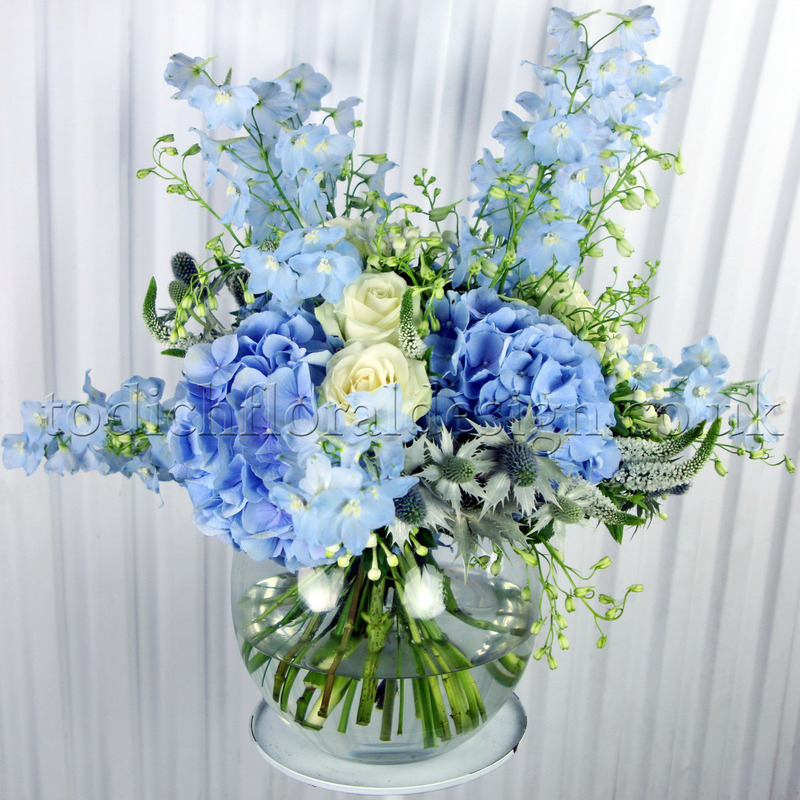 We love getting our florists to create beautiful new designs and coming up with new unique styles which have not been seen before. 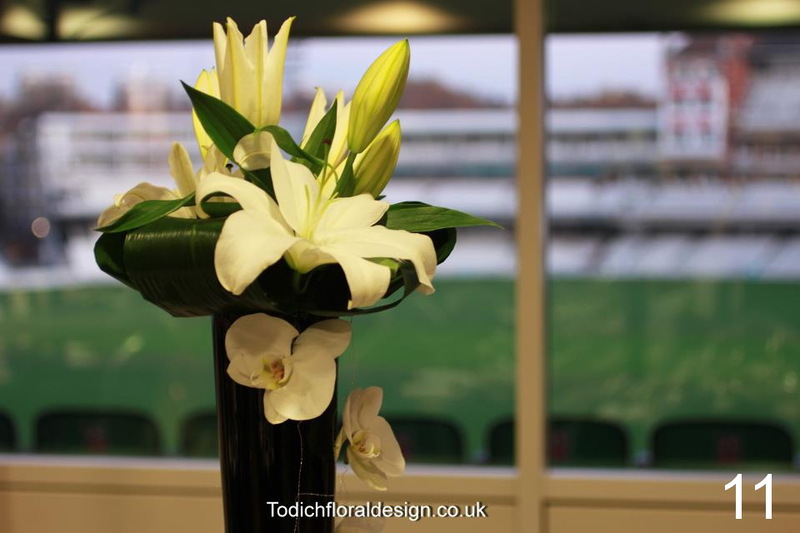 Recently we were asked to provide the flowers for Surrey County Cricket Club as the event was to celebrate the ‘End of Season Awards’. 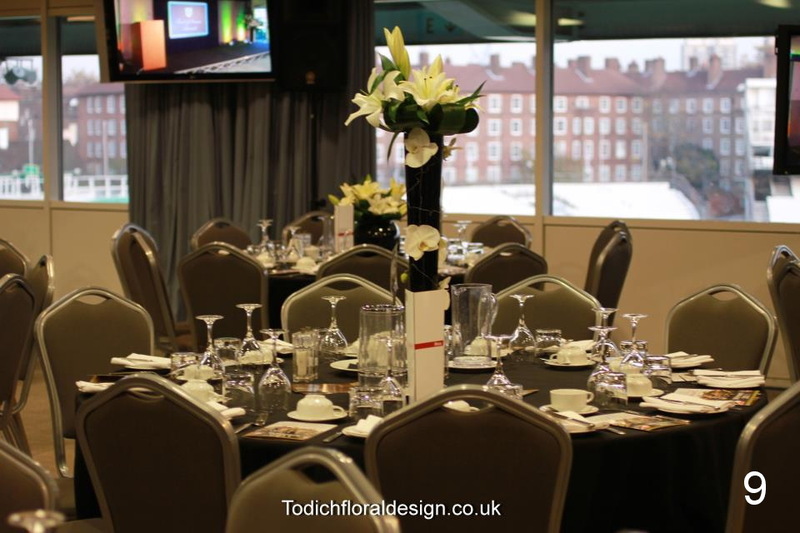 The event was held at the Kia Oval in Kennington, London, which was a very stylish venue of monotone colours. 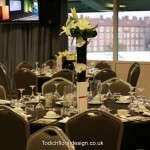 In-keeping with the event, we were asked to provide low table centres, tall vases and a grand candelabra for the stage. After our sales consultant visited the venue our floral designers came up with simple stylistic designs which would match the colour theme of the event. 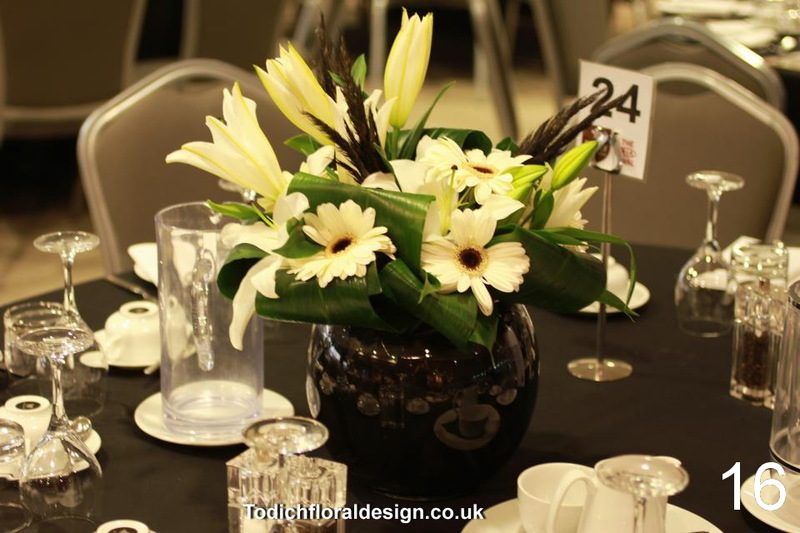 For our low table centres, we put together a selection of seasonal white flowers, open white lilies, white gerberas and black sprayed pampas grass, these combined flowers made stunning centre pieces on the tables; also the monochromatic displays juxtaposed the elegant black table cloths. 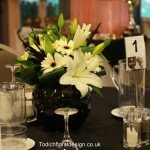 Our tall vases were contained beautiful white lilies, gerberas and orchids which were elegantly spiralled around the vases and left resting on the tables. We used black vases which complimented the overall colour scheme and we were conscious to providing continuity and add elegance to the ceremony. Our candelabra arrangement was the main focal point at the venue and needed to look spectacular and eye-catching. 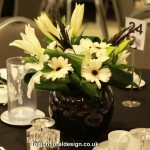 We used a tall black vase and filled the flowers with larger gerberas and lilies. 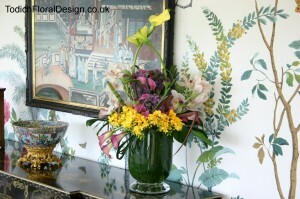 The design was contemporary and matched the other vases. We were very happy with the results and more importantly the client was impressed with the finishing touches of the venue. 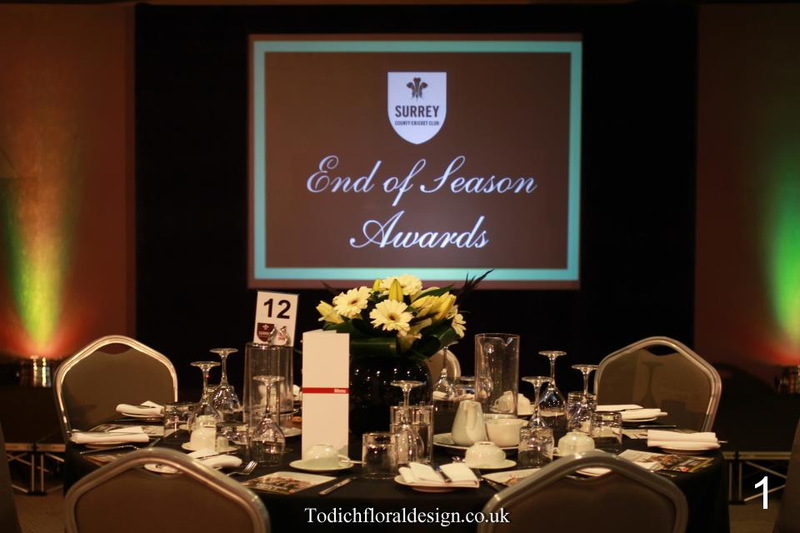 The awards are a richly deserved celebration of a superb season for Surry County Cricket Club and we look forward to providing more flowers for them in the future. If you would like us to provide flowers for yourself or an upcoming event then please do not hesitate to get in touch, We would be happy to book a consultation with you and talk you through any ideas that you have in mind. Simply give us a call on 02077371166 and we would be happy to help. Follow our countdown to ensure nothing is overlooked on your special day. Firstly we at Todich Floral Design recommend that every bride should put together a scrapbook of ideas. Gathering favourite images of flower varieties from magazines and the internet is a great way to find out what you like or do not like. We also advise adding photographs of your chosen theme and wedding venue in the scrapbook as this will also help us and you determine the look you are after. We exhibit at the Earls court wedding show every year and find that brides visiting the shows often find a new style which they hadn’t considered before. We honestly believe that it makes a big impression if the brides are able to handle the bouquets, With brides feeling the weight, and looking up close, feeling the different textures of the flowers, helps them see more clearly, which floral style is best suited. 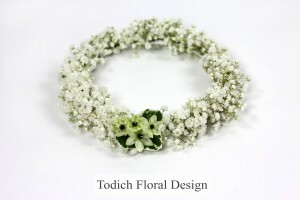 We at Todich Floral Design treat every bride’s special day as if it was our own. We understand the importance of a wedding, and we have no time limit for our consultations and we are happy to discuss the wedding flowers with you, We recommend booking with us earlier rather than later so that we can devote out time solely to you, With a scrapbook at hand we would be able to gather an understanding and guide you for the best colours and flowers, If you do not have the scrapbook prepared then we would be happy to show your our portfolio of past weddings and guide you through all the recent designs. When you confirm your booking with us, we will confirm all the details discussed in writing. Including an estimated breakdown of costs. We at Todich Floral Design would very much recommend you show the florist your wedding venue, either by inviting us with you or showing us photographs of the grounds and interior. We want to make your day perfect, and with one of the florists seeing the layout we would be able to guide you to the best way to decorate. It is around now that we suggest is the best time to finalise your flower order, together with the number of arrangements needed. If you have decided that you would like to wear flowers in your hair, then we recommend that you order a trail set with us and have a run-through with your hairdresser one of two times, to make sure everything is perfect for the special day. The big day is looming and this is the time for final confirmations, the florists at Todich Floral Design recommend brides hold a final meeting with us so that the number, style and colour of arrangement are finalised. Provide all necessary details of all delivery addresses, we are happy to deliver to your chosen address in the morning of the wedding, or if you would rather, we can deliver the evening before, leaving you with less stress for the wedding day, but we recommend you double check the venue for delivery times first. Like most florists we recommend you find out when the florists expects the bill to be settled, as a general rule of thumb, it is normally 10 days in advance. We at Todich Floral Design have your flowers ordered 1 or 2 days before the big day, we make sure we buy the flowers at their freshest, and make all the designs up the day before the wedding, allowing time for flowers to open and flourish, ready for the big day. 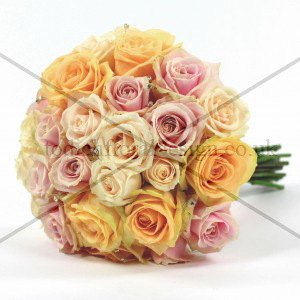 If you by chance change your mind or if we have a problem with buying the flowers requested then we order the alternatives as previously discussed and agreed to in the consultations. We would always make sure that all last minute arrangements and possible alternatives have already been discussed, if unforeseeable circumstances occur. Being in the industry for over 15 years, we are very much in the know of emergency numbers and the best people to contact should any problems occur. Everything is now over to you, your big day is here and the excitement and new life beings. The very last steps are very easy final checks for your big day. Don’t forget to store any other buttonholes and corsages in a cool dry place. Always remember to give buttonholes for the groom’s side of wedding party to the best man. Last but not least, remember to dry off their stems at least half an hour before you leave for the ceremony, so there is no danger of them staining your dress. Secret tips to create the perfect wedding flowers. It’s the magic and romance of weddings that we at Todich floral design love most, we tell every bride that her bouquet is one of the most important elements of the wedding day, We want out brides to feel special when they see their bouquet for the first time, Lots of girls get tears of joy and an excitement that the special day is almost here. 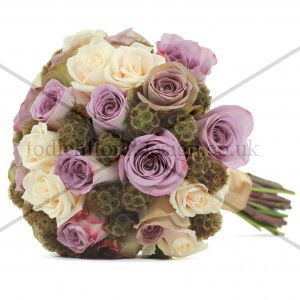 It is best to book your florist as soon as possible to avoid disappointment. We at Todich floral design only every take one wedding a week, as it’s important for us to be able to give time and energy to each bride’s wedding flowers. 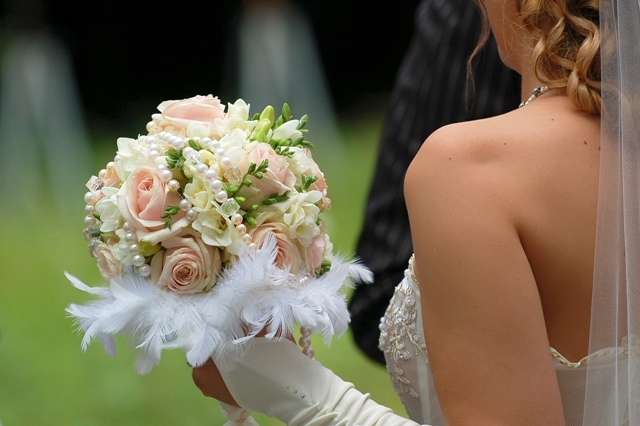 So as soon as you’ve decided on the venue, the date and the dress, it’s time to turn your attention to the flowers. It is always helpful if you tell the florist as much information as possible, we would love to hear about your dreams for your big day and what you would like to achieve. Bringing in photographs or magazine clippings is great for the florists, we even suggest creating a mood board of pictures of your dress, the bridal party’s outfits and samples of fabric so we can try to grasp a definite theme or colour scheme coming through, making the consultation much easier. If you have not found anything suited then we have a portfolio full of past designs which we would be happy to talk through with you. We always arrange more than one consultation with future brides so that we can develop a relationship and an understanding to exactly what you wish, The florists at Todich floral design truly believe that the most important thing about the initial consultation is the rapport. We always ask about your budget at the very first meeting, as it’s extremely important to agree on how much we are working with before starting on the design concept. We will then try to accommodate the design agreed upon within that budget, and when the proposal is accepted, we stick firmly to the budget unless any further additions are requested by you. Try to take seasonality into account when deciding on your wedding flowers, and pick varieties that will be at the height of their season around the date of your wedding. This way, you will find that the flowers will be particularly stunning and fresh, and your budget will stretch that little bit further. The time of year can also help set your theme. For example, spring brides could go for foliage, bulbs and sprouting twigs for a fresh country feel. Those having a summer wedding might decide to go for a generous herbaceous border flowers mixed with lush green grasses. In autumn, we would suggest seed heads, fruits, twigs and hot, spicy vibrant colours. And in winter, look for sumptuous flowers in deeps colours such as crimson and violet. Take time to identify the central, personal theme of your wedding, as this can shape the decorative style of the whole day. For some brides, their theme may be a colour, a piece of music or a season, while for others it may be a love of fairy lights or perhaps jewellery. Once the bride has found her theme, it is very inspiring for the florist, who can then biggest design concepts to reflect the ideas and create truly wonderful displays that will remain in the memory of the couple and their wedding guests for ever. Finally, it’s important that the flowers and shaded you choose work with your hair, colour, skin tone and bridal make-up. Think of your bouquet as an accessory, and choose it as you would a handbag or a pair of shoes. If you’re unsure, consider paying for two or three different sample designs and practise holding them to see which weight, style and colour you prefer. 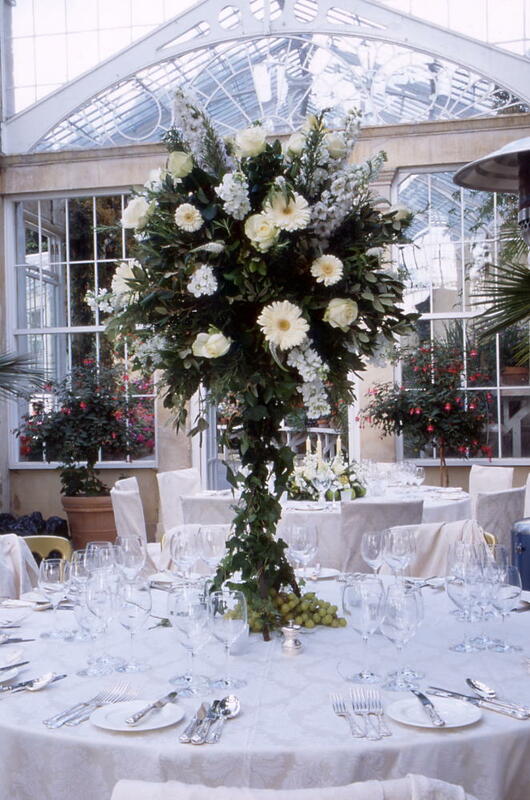 The floral displays at your ceremony are vital for creating that all important first impression. This blog contains our top tips for guaranteed wedding wow factor! 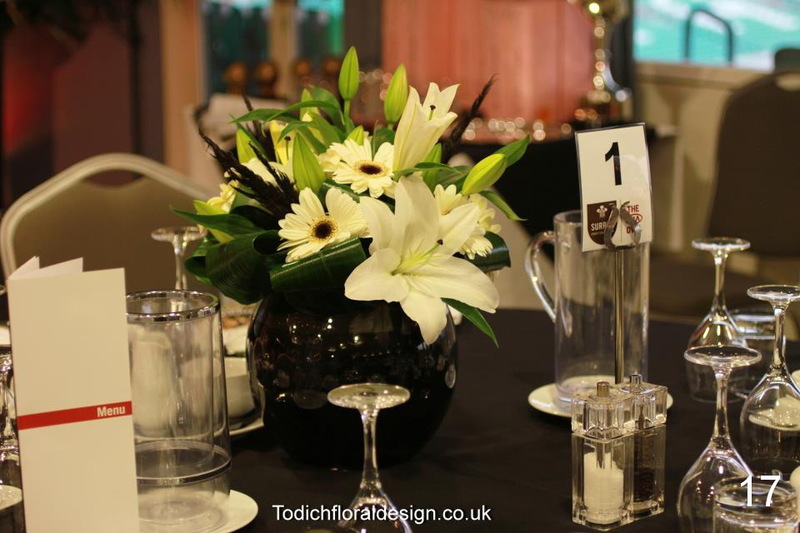 Whether you are tying the knot in a register office, religious setting or at a licensed venue, we at Todich Floral Design can create help amazing displays to perfectly match your chosen type of service. While you don’t have to spend a large amount of money, some floral accents at your ceremony are essential; as this will be the first time your guests get a feel for the style and theme of your day. It’s a really good idea to show us photos or even allow us to visit the space at least once before the wedding so that we can make everything perfect for your special day, we can make the most of the architecture and atmosphere, and have an idea of any colours to avoid or to complement, we would make sure that the flowers would make a great first impression. We would be happy to guide you with ideas through a consultation at our studio. The floral designers at Todich Floral Design will give you hints and tips for areas you may not have been considered, for example why not decorate the entrance to your venue?, Traditional floral arches, such as a stunning mix of lilies, roses, orchids, hydrangeas, leather leaf, chrysanthemums and aspidistra leaves are a wonderful way to welcome your guests. 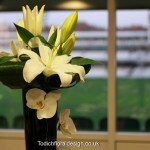 The same impact can be made with large pedestal arrangements at either side of your venue entrance. The impressive displays can contain any flowers you wish and it is always a cheaper and better to choose flowers in season. Why don’t you add a sense of gravitas to the occasion? If you’re working to a small budget, a hanging arrangement may be best for you, cascading orchids, scented lilies and beautiful dainty roses would be an eye-catching display for you and your guests. 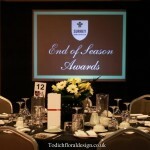 To create an effect with an impact with a significantly lower cost, then it would be a great idea to reduce the sequence of displays at the table centres. Including some colour to your ceremony room, church or synagogue by adding small floral displays to pew ends or to the first chair in each row can create a wow factor!, why not include trailing posies of fragrant Singapore orchids and roses to just a few chairs lining the aisle. And, of course, the classic way to decorate any ceremony room is with an eye-catching pedestal. A display of roses, guilder rose, tulips , eucalyptus and ruscus arranged in a church font perfectly complements the venue’s décor, and is bound to have made an impact everyone. It was only a few years back that the ‘something old’ in the familiar wedding day adage might have meant, at most, a family necklace glimmering above the neckline, or an old piece old fashioned, attire only worn to not cause dismay to certain family members, but in the last year a sea of change has taken place, with more and more brides choosing to reject the new and instead rediscover the charms of pre-loved pieces.it seems the pre-owned fashion Items with a history has definitely made its mark to stay. Vintage has sky rocketed in popularity, the recent royal wedding of Prince William and Kate Middleton unsurprisingly showed the princess wearing a traditional 1950’s style lace dress and holding a simple white bouquet of Lily-of-the-valley, Sweet William, Hyacinth, Ivy and myrtle. The classic craze has certainly flourished within the flower industry. Vintage has definitely set its mark among the brides to be. 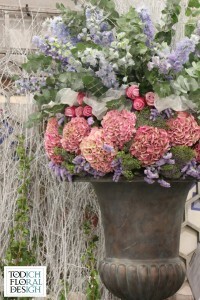 Todich Floral Design kept with the trend and exhibited at The Wedding Show 2011 in Earls Court with an exquisite display of vintage style pieces, including the infamous Amnesia Roses, Vanda orchids and Scabiosa pods. All of which caught the eyes of the happy couples. The Amnesia Rose in-particular have become very popular over the last few years, due to its reliability with flower heads that are always fully open and all year round, it is no wonder that these extraordinary roses are a firm favourite when creating Vintage style wedding flowers. Its unique beige, lavender and green colours tone magnificently with many other flowers, we also find that mixing the roses with soft pinks and whites also create a dramatic effect. Quite often because of their mystifying beauty, Amnesia Roses are used in simple clusters with just foliage to accompany them. By choosing a mixed bouquet of seasonal English flowers with a small amount of foliage running throughout the bouquet you would be able to create a vintage look’. Many brides are dressing the venues with simple designs to create a natural garden appearance. 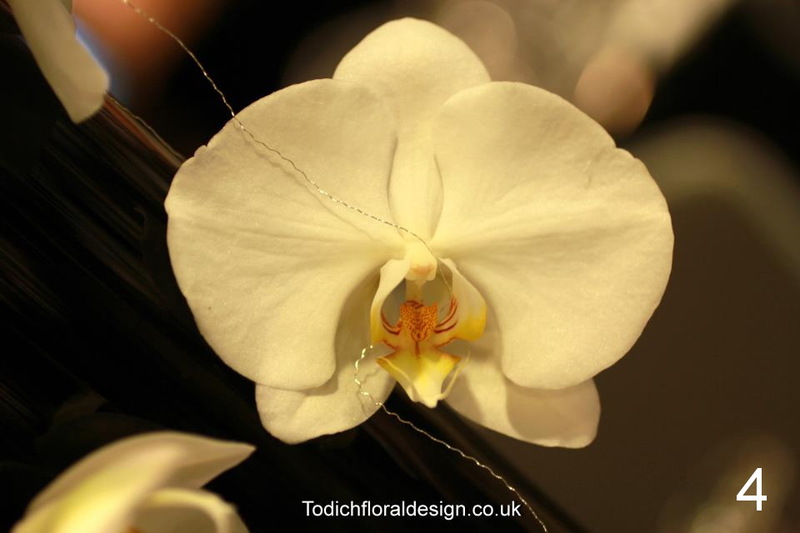 The designers at Todich Floral Design say ‘It is the attention to minor details that is important in creating a classical period look. Accessories can also be incorporated into your flower designs such as using diamantes, pearls, brooches and velvet ribbon, we would be happy to quote you on any unique or intricate ideas you may have to make your special day, a day to remember. So don’t forget, being original is the key, mixing of old and new, and by adding seasonal pastel flowers will create the antique classical look which you are looking for. 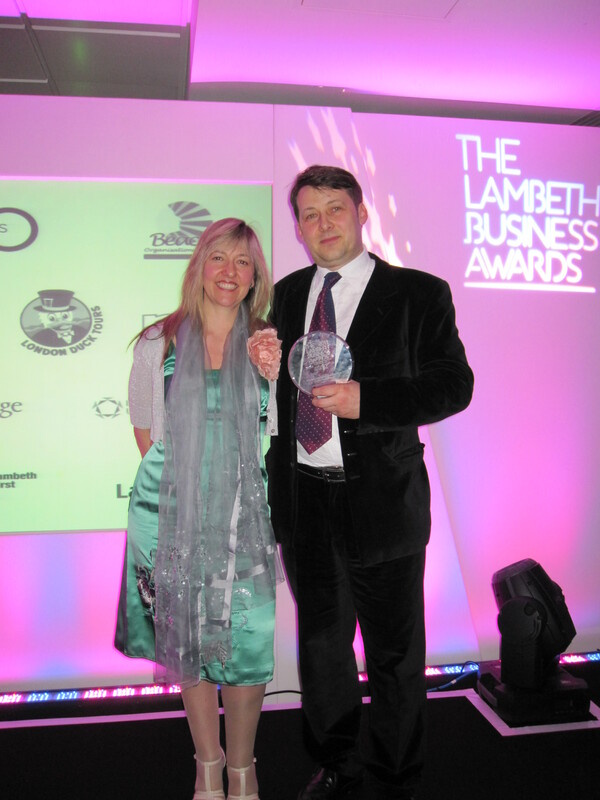 Last night at the awards dinner Lambeth Council chose us as South London’s Best Business for Customer Service. Salvaged flowers save the day! 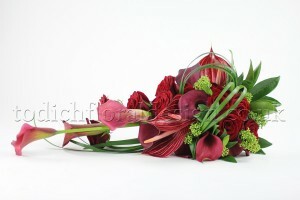 Flowers can be a very important element for just about any event. They can brighten up and add the finishing touches to just about any space you can imagine, even fields and pastures! The World Equestrian Games, soon to take place at the Kentucky Horse Park. But the road to preparing the event was not all smooth sailing. Around mid-summer organizers of the event found that their floral budget had been cut. Luckily with a helping hand and generous donation from the UK College of Agriculture, the games will not be short of flowers. Volunteers involved in solving the problem also found themselves short on time to grow the flowers. So they had to approach the problem from a different angle. Flowers that hadn’t been sold, or were on their way to dying were tended and brought back to life. The volunteers made their way through several greenhouses, salvaging whatever they could find. With a bit of fertilizer and some re-potting the flowers were ready for their trip across the ocean. The flowers will be used to decorate the park and jumps for the games. All it takes is a little innovation and creativity to really make an event memorable and enjoyable. This is why at Todich Floral Design we enjoy helping you decorate and organize your events. Our custom tailored floral decorations will bring the best out of your private, corporate, cultural or Christmas event. Our floral designs will be suited to your needs through free design consultations, and will be carefully installed to ensure that your ideas are brought to life in perfection.